her life has now taken an unwanted turn. First there is the abdominal pain. the pain is that excruciating. curl up in a ball, and wait it out. most every morning, most every evening. wherever she is, whatever she’s doing. Daily she must conserve her energy carefully. she has been told her condition cannot improve. Shannon has become a friend of mine. are nothing less than heroic. Shannon is an important reminder to us. It’s true that caregiving can be demanding. 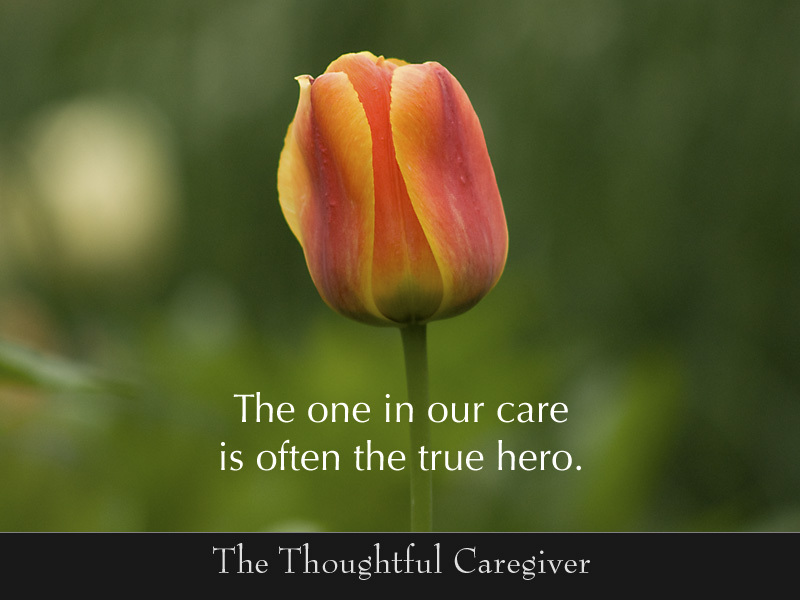 in how some of us caregivers live out our roles. that is even more heroic. or unnerving fear, or unrelenting depression. that are fatiguing, or alarming, or humiliating. but even the length their lives. Such individuals are examples of heroism personified. We dare not forget that. This entry was posted on January 3, 2018 at 12:58 pm and is filed under Caregiving. You can follow any responses to this entry through the RSS 2.0 feed. You can leave a response, or trackback from your own site. I have never thought of myself as a hero. It is family that I have been a caregiver for over 5 years now. Still, the challenges seem to grow daily, particularly now that my mother’s dementia is progressing, and the test of my patience grows proportionately. Still it is family! I can share the responsibility, but I can’t give it away. My brother has Down’s Syndrome and often doesn’t understand why I can’t let him do some things that a reasonable person would know. My sister just had major back surgery and I can’t expect her to do the things she used to do around the house. They’re family and their needs give me purpose. Besides, they take care of me too! Do you offer this image and expression about care givers in a greeting card or note card?